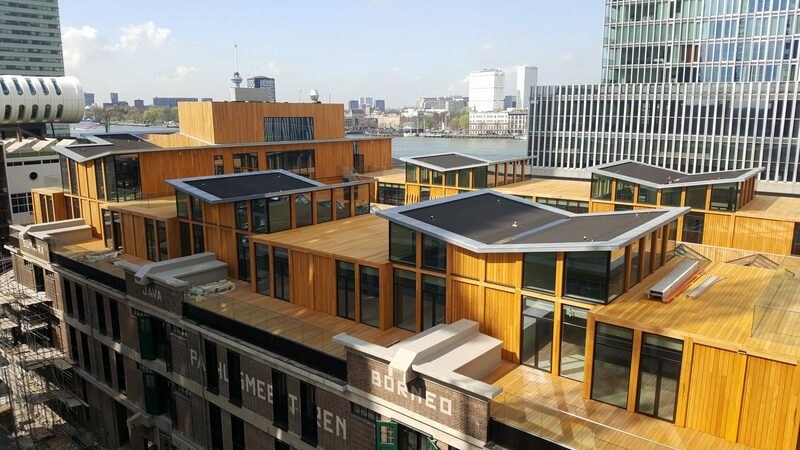 Nominated for the award “Roof of the year 17” in Holland. 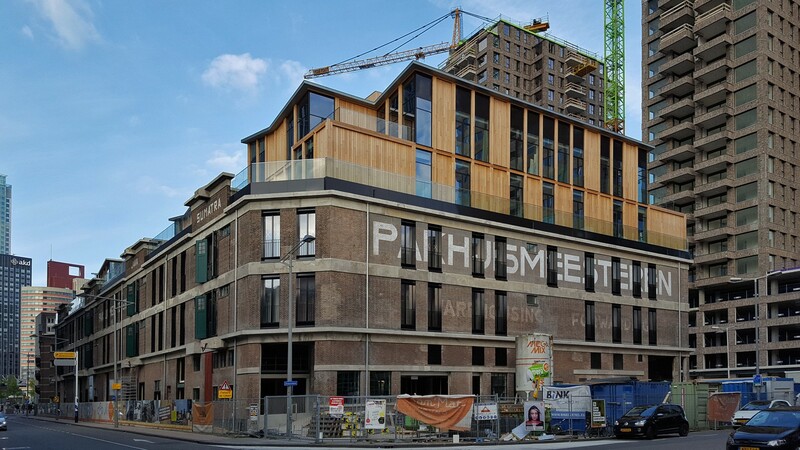 The landmark Pakhuismeesteren on the Wilhelminapier in Rotterdam is being converted into a modern hotel. The building dates back to 1890 and was formerly a storage warehouse for grain, nuts, tea and spices. The characteristic, original concrete structure of the warehouse is being retained and is visible in the mezzanine in the heart of the hotel. 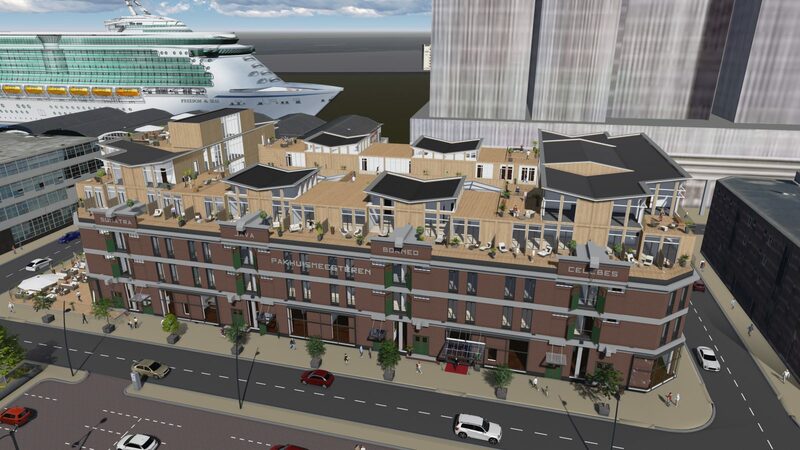 Partly because of the fantastic view (Kop van Zuid) the roof has been designed as a roof deck. 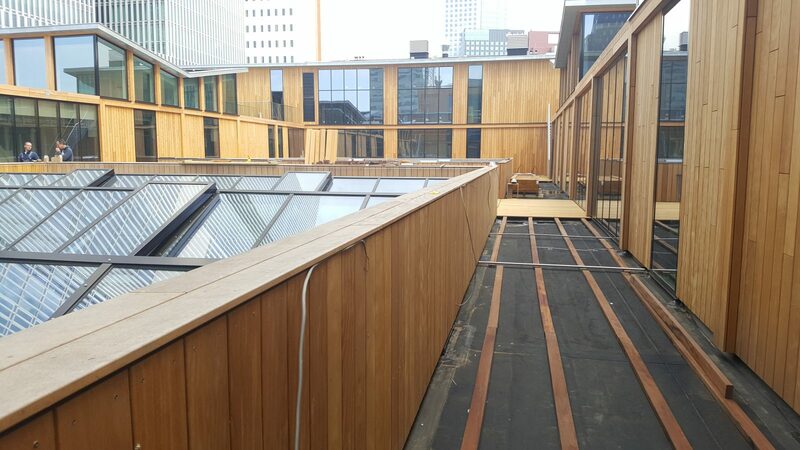 Features of the roof deck are the wooden decking on the floors and the façades of the studios which have been sited on the roof. The roof deck has been built on a concrete roof, over which a bituminous damp inhibitor and sloping PIR insulation have been installed. RESITRIX® MB has been used as waterproof layer. Because of the wooden decking the EPDM roofing has been loose installed. The studios on the roof are also fitted with RESITRIX® MB. Because of the wind load and the heavy trapped air due to the surrounding high-rises the roofing and insulation on these slightly sloping roofs have been mechanically fixed in the overlap. RESITRIX® EPDM roofing has been selected because of its long service life and convenient handling. When installing RESITRIX® there is an immediate visual confirmation that the laps are 100% reliably sealed. As the welding nozzle passes along the laps, a continuous and visible welding bead appears which guarantees that the laps are permanently sealed. More elaborate examination of the welded laps using test probes and other specialist equipment, thereby becomes completely unnecessary. The many details can easily be integrated with the EPDM roofing. EPDM is an extremely (permanently) flexible material which can be handled without the use of an open flame and, therefore, is well suited for this project.